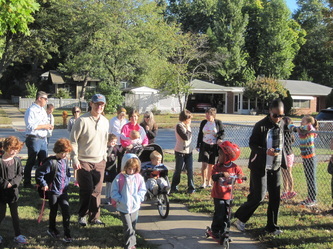 We had a great turn-out of bike decorators and parade riders on July 4th! A BIG Thank You to our patriotic, enthusiastic (and patient) participants, judges, and volunteers! 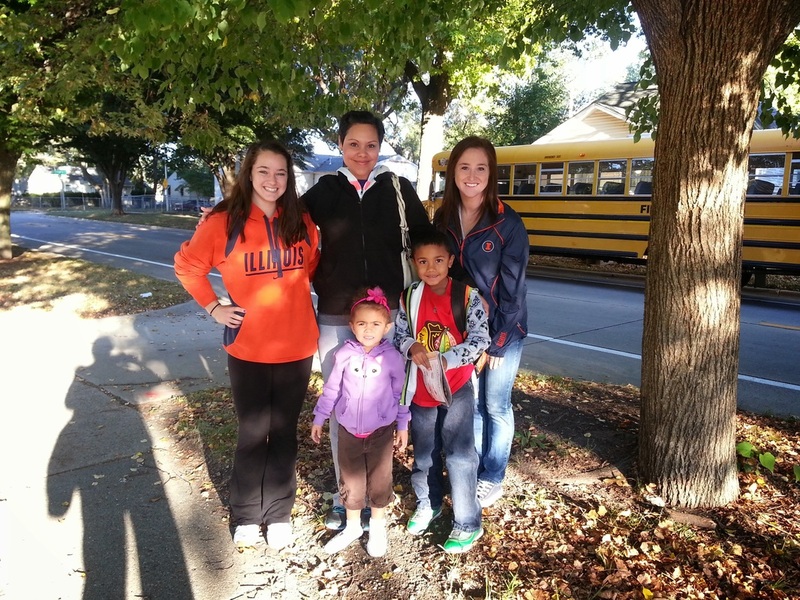 11 Champaign-Urbana schools participated in Walk n' Roll to School Day (WRTSD) October 9th, 2013! 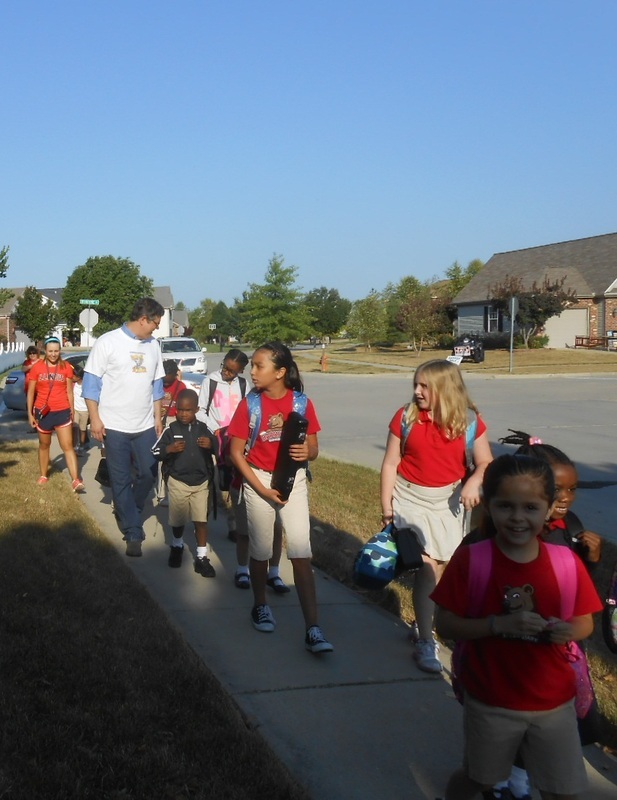 Students walked with friends, parents, teachers, law enforcement officers, Urbana City Council member Carol Ammons and Champaign Mayor Gerard! 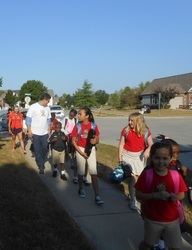 Balanced Calendar Walk n' Roll to School was a Blast! Mayor Gerard and U of I football and women's golf athletes arrived early at Barkstall, Kenwood, and Thomasboro elementary schools on Friday September 6 to greet students walking and biking to school and encourage physical health. 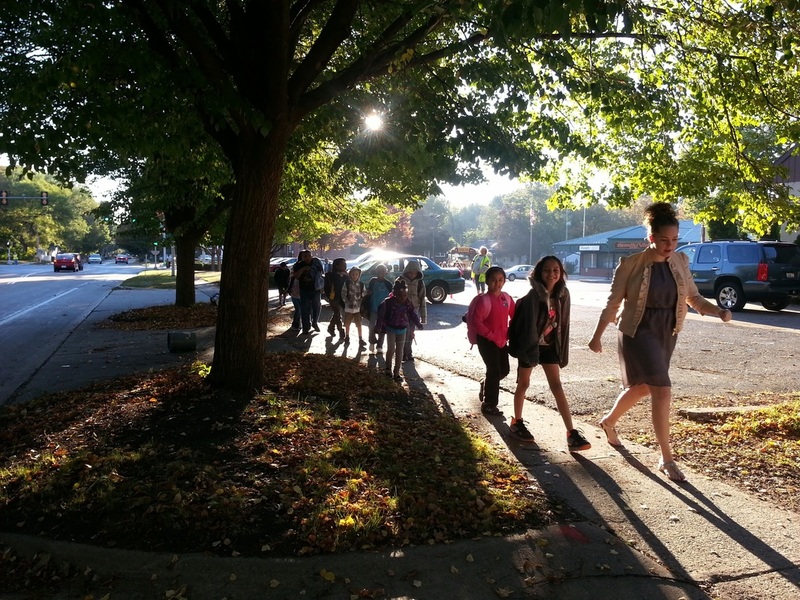 Students who took the bus to school were dropped off approximately 1/4 mile from the school and enthusiastically enjoyed a short and sunny morning walk. A big thank-you to all our athlete volunteers, to Mayor Gerard, and particularly to the teachers, school staff, and parents who were so critical to the event's success! 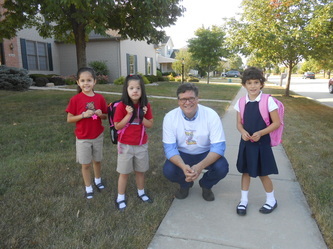 More great photos available at the News-Gazette! 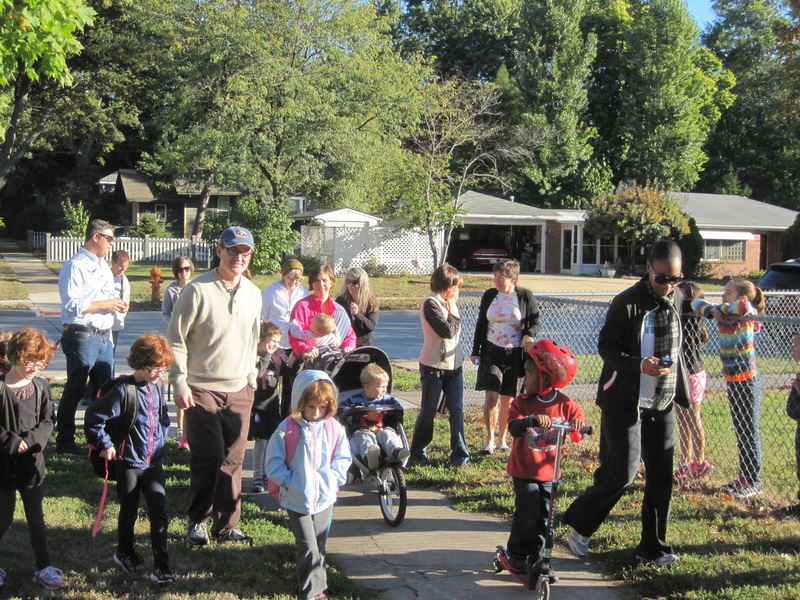 The City of Champaign and the City of Urbana both made Proclamations of Walk and Roll to School Day in 2013! 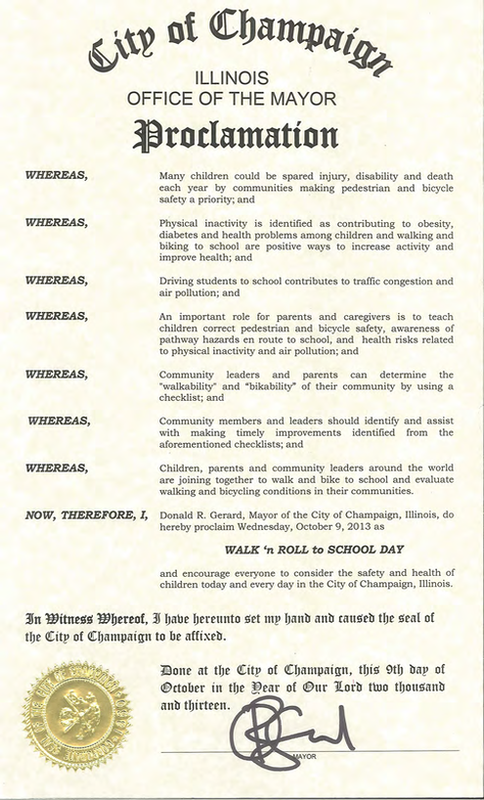 The purpose of a Proclamation is to increase awareness among elected officials and the public about the importance of biking and walking. 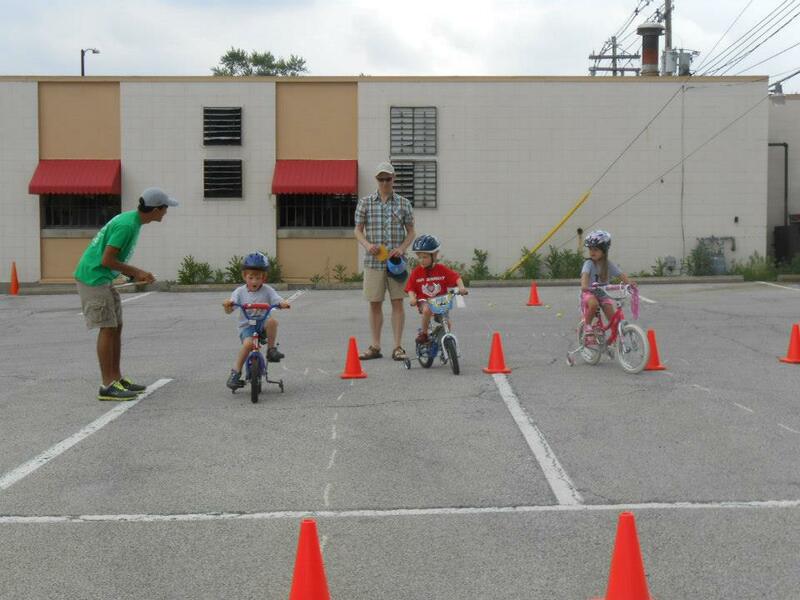 September 21, 2013 -- About 23 kids rode through the obstacle course for the Fall Market at the Square Bike Rodeo! What a beautiful day it was to be on a bike! View more photos of the rodeo here. 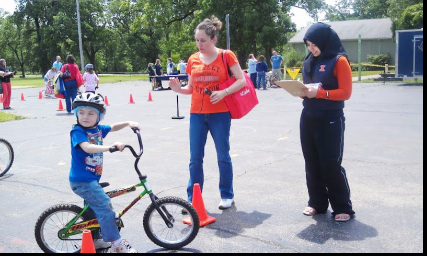 June 1, 2013 -- The storms held off for Playing it Safe, a safety fair sponsored by Carle and Safe Kids Champaign County where kids and families learn from exhibits that feature safety information and activities for families. 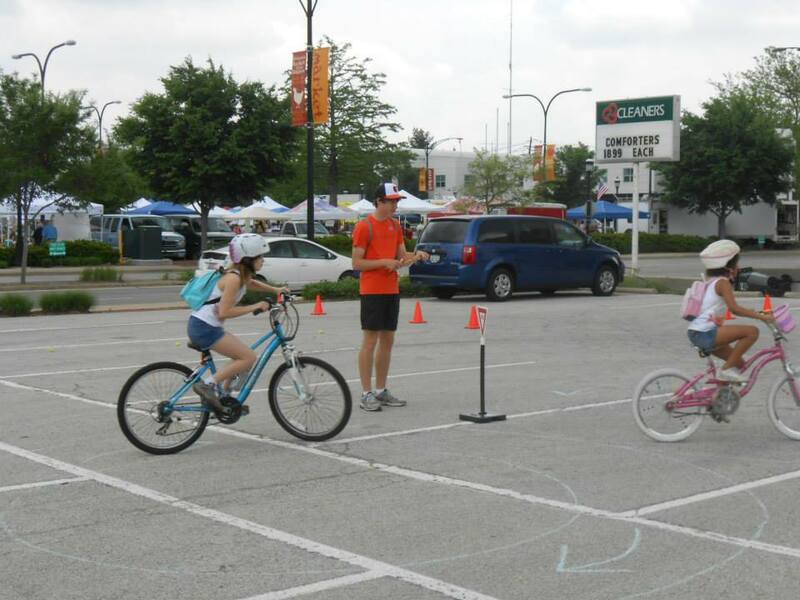 C-U SRTS hosted a bike rodeo and over 90 kids bicycled through the course and practiced safe cycling skills! 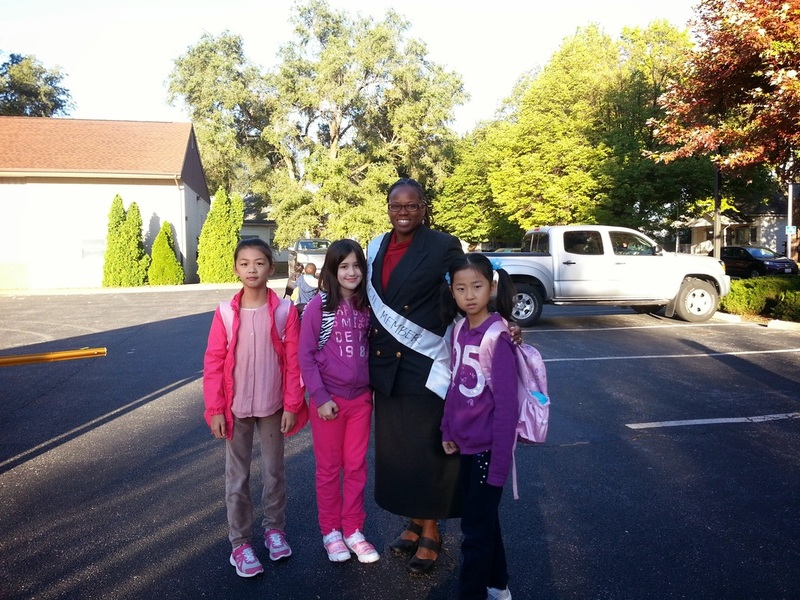 See more photos on our Facebook page here. 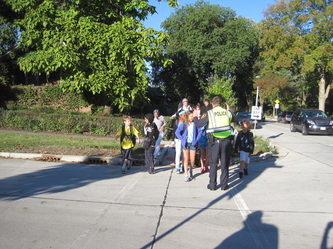 Amelia Neptune explains the Starting and Stopping Station. 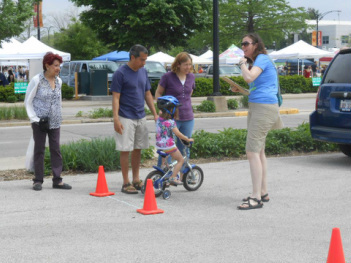 May 18, 2013 -- At the Market and the Square in Urbana on Saturday May 18 kids practiced stopping, yielding, dodging, and turning at another successful bike rodeo. 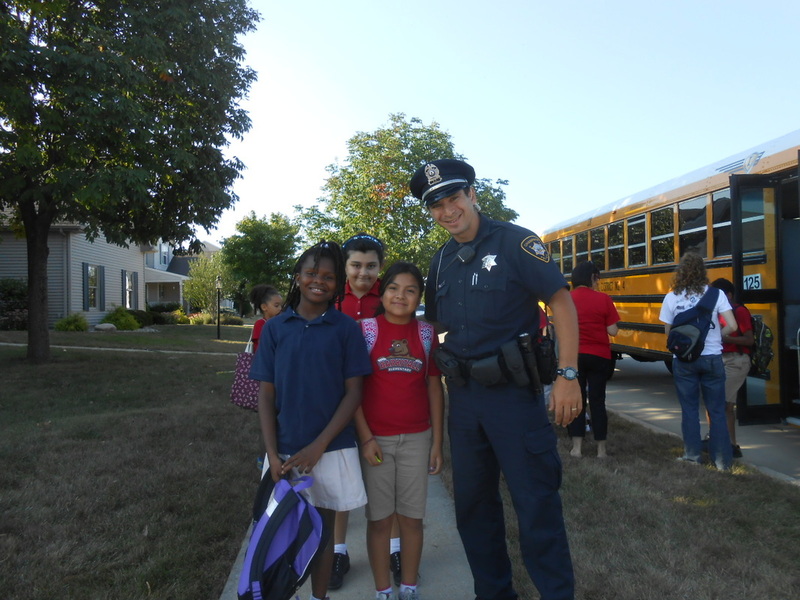 See more photos below and on our Facebook page here. 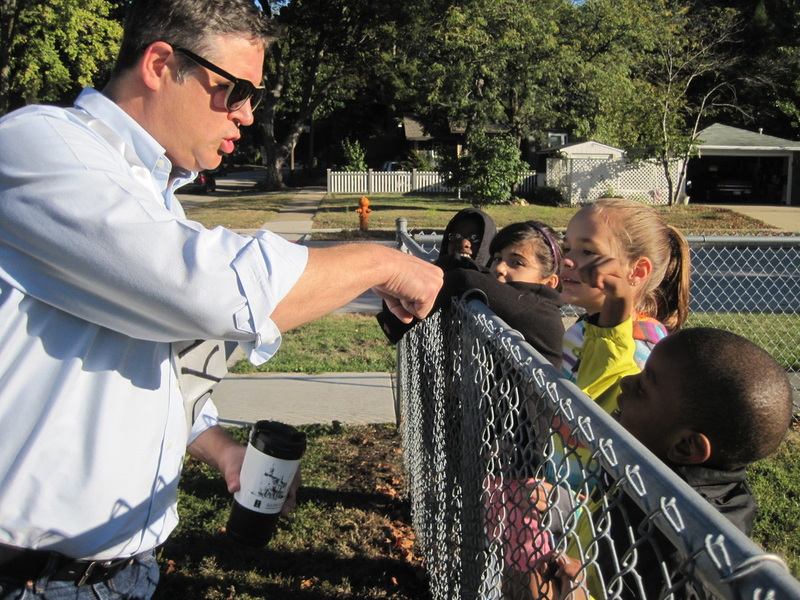 April 20, 2013 -- The kids, residents, and staff of Orchard Downs, along with CU-SRTS Project, and CU Public Health District, and The Bike Project enjoyed the sunshine on April 20 while learning some spiffy bicycling safety skills! Kids navigated four different courses and practiced coming to a stop, yielding, turning, and balance. Some even rode a two-wheeler for the very first time! 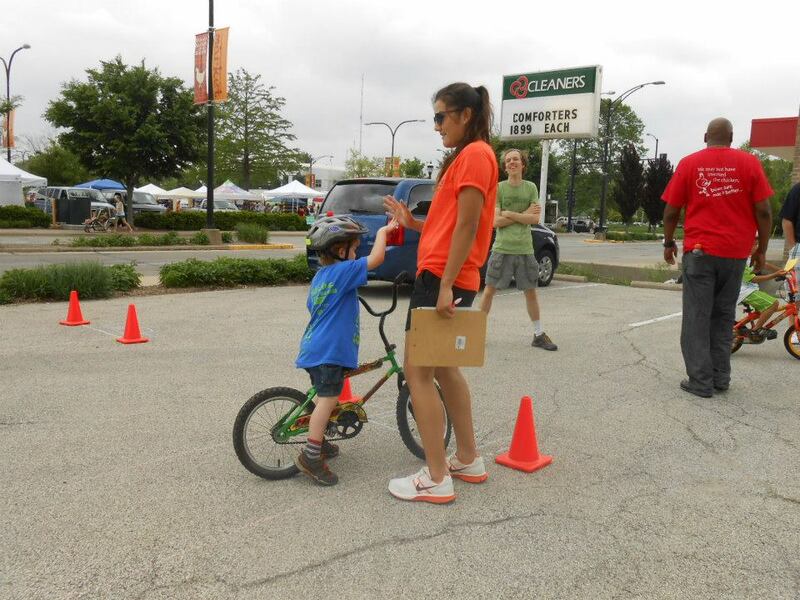 Special thanks to awesome volunteers, U of I students, and The Bike Project for helping to make this event a success! See more photos of the Orchard Downs Bike Rodeo on our Facebook page here.